Christmas is going to be difficult for me this year as it’ll be the first major holiday we celebrate without my dad. Part of me wishes we could just cancel the whole thing, but I cannot bring myself to take that away from my 3-year-old, especially since this is the first year she actually understands the concept of Christmas trees and Christmas lists and Santa Claus. So when we were wandering around the mall a few days ago and she excitedly stopped to yell, “CHRISTMAS TREE!” before bolting towards a beautiful display of fake trees and ornaments, I chased after her and asked if she’d like to buy a tree and decorate it with me this year. And when she excitedly yelled, “YEAH!! 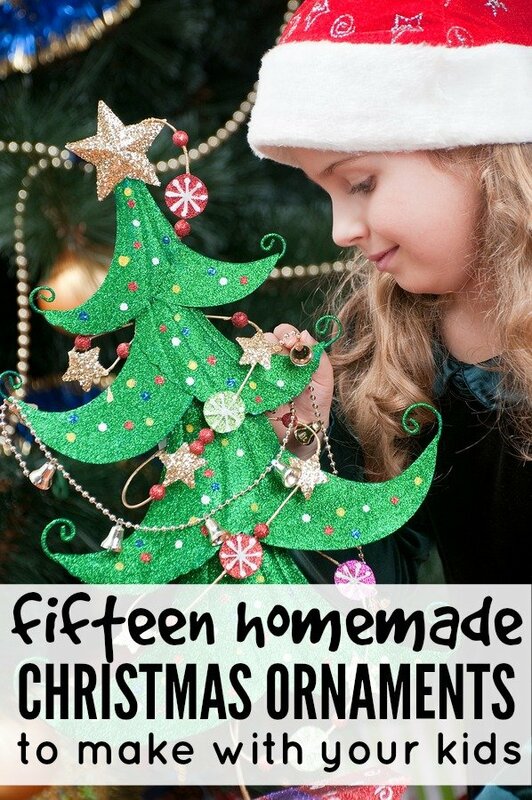 !”, I decided we would spend the month of December making our own Christmas ornaments for our new tree, and would then give some of the ornaments away as Christmas gifts to family and friends on Christmas day. Of course, this is going to be a big undertaking, so I’ve already started to put together a collection of my favorite DIY Christmas ornaments we can make together. And since I know other moms and dads out there may want to do something similar, I figured it couldn’t hurt to share them. If you have ideas to add to the list, please leave me a comment below! If you’re looking for more fun, engaging, and educational kids crafts, activities, and boredom busters to help you have more fun with your kids, check out my Fun With Kids board below!